We've seen reports on the internet claiming that the majority of extra-virgin olive oils sold in the USA are "fake". We'd like to take a moment to break down that claim. The use of the word "fake" may be complicated. Olive oils can be deemed "fake" if they are adulterated, meaning that the oil is not from olives or has been mixed with non-olive oil. The other reason why an oil can be deemed "fake" is because it does not meet the quality standard listed on the label. The NAOOA routinely checks olive oils sold in the United States for purity. We subject over 200 samples in a year to chemical analysis and we have found that over 98% of the time, the oils are 100% olive. In other words, not fake. 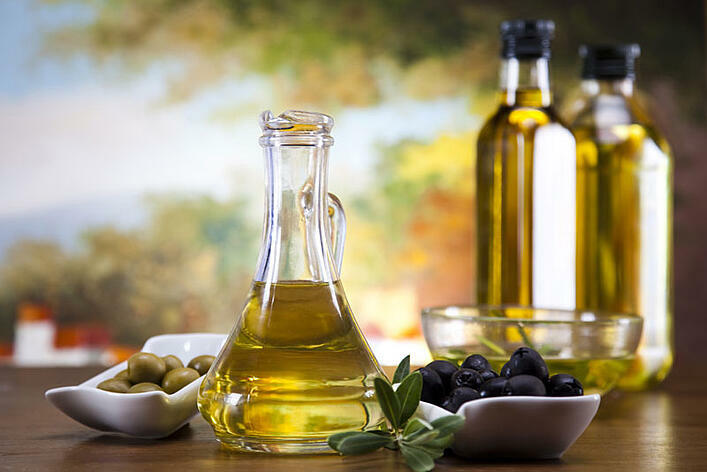 You can rest assured that the oil you are buying is almost certainly made from olives and not cut with another type of oil. The NAOOA also checks for quality. This is where things get complicated. To check for quality, olive oils are subjected to both chemical and sensory analysis. Chemical analysis checks for things like free fatty acid content, UV absorbency, peroxide value and more. There are values that an olive oil needs to pass in order be rated as Extra Virgin. Sensory analysis involves trained panels who use their senses of taste and smell to assess the oil. Olive oils that are "cold pressed" or extracted by mechanical means are eligible for the designation extra virgin or virgin. If the oil does not meet the chemical or sensory standard set by the IOC for extra virgin olive oil, then it will be designated as virgin. However, some quality measures - especially flavor - change over time. The many accusations of "fake" olive oil recently are essentially a debate as to whether some extra virgin olive oils should really be labeled virgin olive oil. Virgin olive oil is hardly a "fake" olive oil. Virgin olive oil is still heart-healthy and contains vitamins and antioxidants. Use of the word "fake" when describing these oils is misleading. The good news is that the NAOOA also checks for quality, and we have found that the vast majority of olive oils that we test do, in-fact, meet the quality standards indicated on the label. The one area we see some discrepancies is on the sensory, or taste, analysis. A true "grade" analysis should be done by a trained panel recognized by the IOC, not by an individual taster. Another accusation thrown at olive oil is the claim that it is "fake" because it was grown in a country that differs from where it was bottled. Olive oil imported from a particular country might have been produced in another country. USA regulations require olive oil companies to list the origin of the olive oil itself on the bottle, usually on the back near the nutrition facts. You can go a step further and buy an olive oil that has an origin seal such as DOP (Denominazione di Origine Protetta) or DOPG (Denominazione di Origine Controllata e Garantita) which is a guarantee of origin. Even without a DOP or DOPG seal, the oil in the bottle is not "fake". The oil is olive oil and not any other type of oil. Again, we know, because we've tested it. The NAOOA tests hundreds of samples of olive oil a year. We buy the oil from supermarkets, just like you do, and subject it to rigorous chemical and sensory testing. We know from our tests that the hype about "fake" olive oil is hugely exaggerated. You can rest assured that your olive oil is authentic quality olive oil.